The making of little quilts for premature babies was started in 2007 as a Mini-Group Challenge. Guild members have responded very positively to this effort, and since 2007 we’ve taken more than 1200 preemie quilts to the UC Davis Neo-Natal unit in Sacramento, as well as several bags of knitted and crocheted preemie hats. 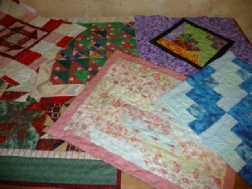 Preemie quilts are a great way to use up some of the scraps and orphan blocks that we seem to collect. A preemie quilt needs to be about 18 to 22 inches wide and 20 to 24 inches long. They can be made from Minkee, flannel and/or kid-friendly cotton prints. They can be finished with machine binding or in pillow style. Batting for a preemie quilt should be cotton batting, flannel or no batting at all. (Since they are washed and dried in high temperatures, polyester batting is not recommended.) A preemie quilt is a great way to practice your machine quilting, since they do not require a lot of quilting. This has continued to be a great, on-going Community Service Project. 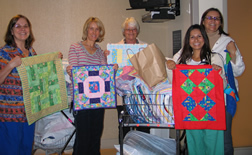 Community Service collects preemie quilts at guild meetings. There is an on-going need for preemie quilts: several quilts are used for each preemie baby; they get frequent washings, and eventually wear out; and sometimes a special quilt is given to the parents of a preemie baby. 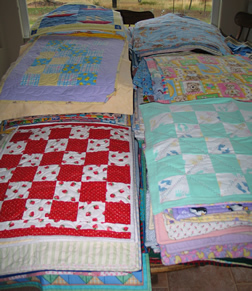 Above - stack and stacks of preemie quilts gathered together. Left - delivering them to the nurses in the neo-natal ward at the UC Davis medical center.